These are the must-have essentials from Little Marc Jacobs F/W 2017 collections for kids fashion. Can you say more than ADORABLE? ALALOSHA's smitten with all of the rich gray colors and tones. Little princesses take an exciting look at what’s to come when the leaves start falling! 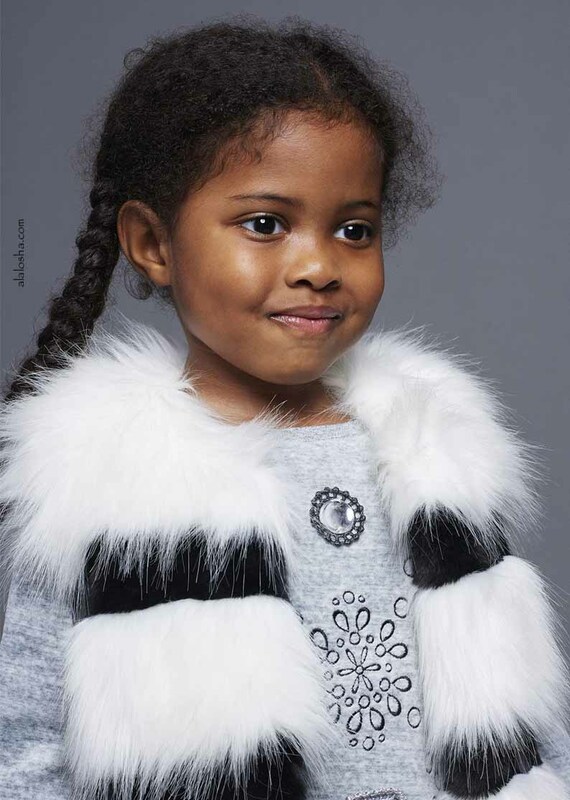 Girls long length gilet by Little Marc Jacobs. Made from white long synthetic fur, with shorter black synthetic fur stripes and a silky lining. A sleeveless coat with hook and eye fastenings down to the waist. A gorgeous gilet, which makes a lovely finishing touch to an outfit. 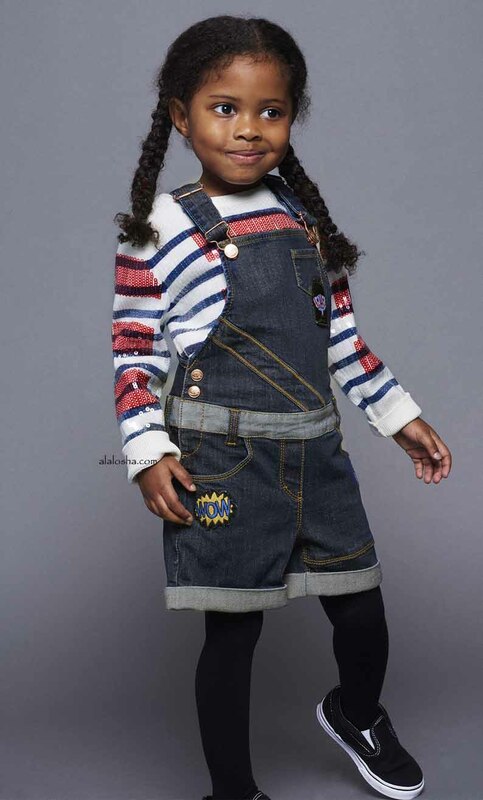 Girls blue short dungarees by Little Marc Jacobs, made with soft, stretchy cotton denim. The shoulder straps have adjustable fasteners and they fasten with logo buttons at the sides. They have pale blue patches, turn-ups and a flag logo at the back. There are badge style appliqués attached on the front and back featuring the designers Miss Marc, lipstick, heart and speech bubble. Girls black, blue and beige dress by Little Marc Jacobs, made with a textured bouclé. A shift style, with a metallic gold zip fastener at the back and a silky lining. It has a synthetic leopard fur skin trim across the back of the shoulders and on the two front pockets. An elegant, short-sleeved dress ideal for smart occasions. Girls black, blue and beige jacket by Little Marc Jacobs, made with a textured bouclé. A double breasted style, with button fastenings and a silky lining. It has a synthetic leopard fur skin trim on the collar and two front pockets. A lovely jacket to wear with a smart outfit or with jeans for a more casual look. Girls stunning black layered skirt by Little Marc Jacobs. The top layer is made from a gorgeous silk blend with a satin feel, an elasticated waist, and a soft cotton lining. It has closed pleats from the waist to the peplum hem, which has a silver floral cut-out pattern and scalloped hem. There are tulle frills in rust-red, black and black with silver flecks, which show in layers at the hem. 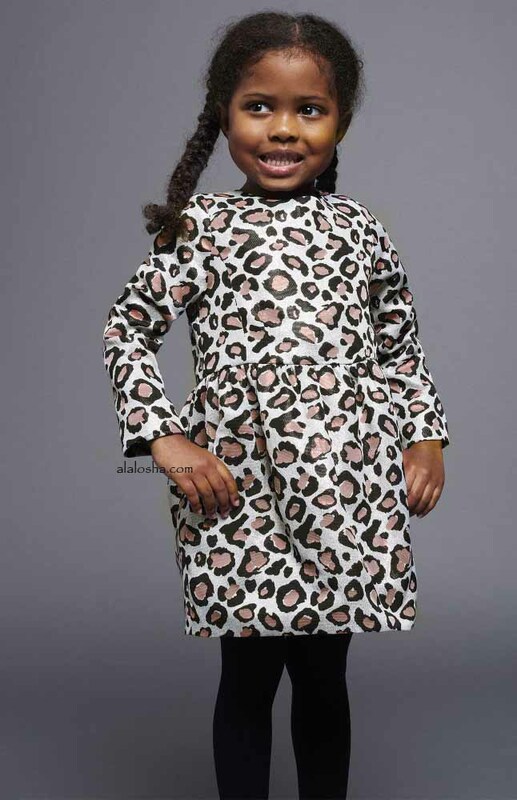 Girls striking silver dress with a pink and black leopard print by Little Marc Jacobs. Made with a shimmery woven textured feel, a smooth cotton lining and a concealed back zip fastener. It has a fitted bodice with long sleeves and the bubble shaped skirt has layers of soft tulle adding to the voluminous look. Comes with a hair elastic which has a black lurex bow. Girls pretty grey sweater dress by Little Marc Jacobs. Made with soft cotton velour, with ribbed cuffs, collar and hem adding comfort and extra shape. The front has a floral embroidered pattern and stunning gemmed details trimmed with glittery metallic lace. A lovely dress which would look great worn with tights or leggings.